With commercial quality equipment, the TRUE ES900 allows you to bring the fitness club experience into your home. Ergonomically engineered to give you a total body workout unlike any other elliptical trainer on the market, the ES900 is the top-of-the-line elliptical cross-trainer. The ES900 elliptical is fully loaded with variety and features, with 360o ergonimically engineered rotating handles, TRUE's exclusive Cardio 360TM programming, 33 preset workout options, Heart Rate Control, ipod integration, and many more advanced features. Introducing the NEW True ES900 Elliptical. The TRUE ES900 elliptical trainer is our most premium residential elliptical on the market. TRUE’s patented Core Drive system delivers the most comfortable, natural and stable workout in the industry. Built on a solid commercial platform, the ES900 offers diverse flexibility, high-end durability, and innovative technology, making it a must-have for your home gym. The ES900 elliptical features innovative side-steps which not only allow safe entry and exit from the machine but also unparalleled versatility by providing the industry’s first upper-body only workout. During exercise, you will notice the exceptional comfort of TRUE’s Soft Step orthopedic foot-pads, which decrease the stress of impact on joints and can eliminate foot numbness associated with many traditional ellipticals. 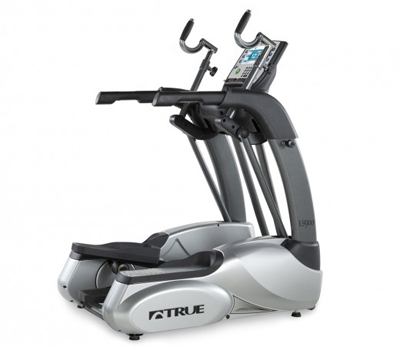 The TRUE ES900 elliptical incorporates TRUE’s patented Core Drive™ system to deliver the most comfortable, natural and stable workout in the industry. The innovative side-steps not only allow for safe entry and exit from the machine but also unparalleled versatility by providing the industry’s first upper-body only workout. The Core Drive system gives new meaning to total-body workout. Paired with TRUE’s legendary patented Heart Rate Control technology and HRC Cruise Control, the ES900 elliptical truly maximizes your fitness investment. In essence, HRC pushes you to greater levels of fitness. Once you have reached your desired training level, simply touch the HRC Cruise Control button and it automatically sets your heart rate and keeps it there for the rest of the workout.